This morning I gladly witnessed some signatures for some friends in our church. It’s something I do on a regular basis. I was chatting with my friends as I signed to verify their signatures and recalled that I have verified peoples’ identity for their passport applications, countersigned visa and residency applications, signed wedding certificates, witnessed wills, and supported applications for children who are part of our church to be admitted to church schools. I am very happy to do this, not merely because it is helping someone out but also because it is a tiny way of reaffirming the status of clergy in our society. Don’t get me wrong. I am not a saint (just ask my wife). I am not looking to be put on a pedestal (it’s way too easy to fall off them) and I am not looking to be revered (even though I am a Reverend). The reason I am glad to reaffirm the status of clergy in our society is that our reputation and thus the reputation of the church and therefore the reputation of Jesus has been somewhat tarnished. Sadly the public falls from grace of a few have sullied the reputation of many. There is an ancient story of a small boy who came back from Sunday School and was asked what they had talked about. Yes. Absolutely. We are against sin. But (and regularly bloggites here will know this of me) I am always acutely conscious that Jesus told his followers not to judge others. He warned against hypocrisy (and reserved his harshest words to condemn religious leaders who were hypocritical). He told us not to attempt to sort out a minor defect in someone else’s life while we require major surgery in ours. When I feel my fingers tighten around a stone in my hand I remember a man drawing in the sand and asking me if I am without sin. So, yes I am against sin. First and foremost I am against it in my own life. I regularly need to ask for God’s grace and forgiveness for the times when I allow his reputation and my life to be tarnished. I need to ask for fresh starts on a daily basis. I need a fresh infilling of his companion-Spirit to help me. But also I pray that those who don’t mind throwing stones at churches will recognise that we are also places of grace, forgiveness, healing and fresh starts. We are all striving to be more like the people God created us to be, but we are not perfect. Forgive us if we ever project a ‘holier than thou’ attitude. Please God may we project a ‘just like you, but forgiven’ attitude instead. Perhaps if we are tempted to condemn someone we should fill our mouths with humble pie instead? One of the things I promised myself is that during my sabbatical leave I would sort out my desk. 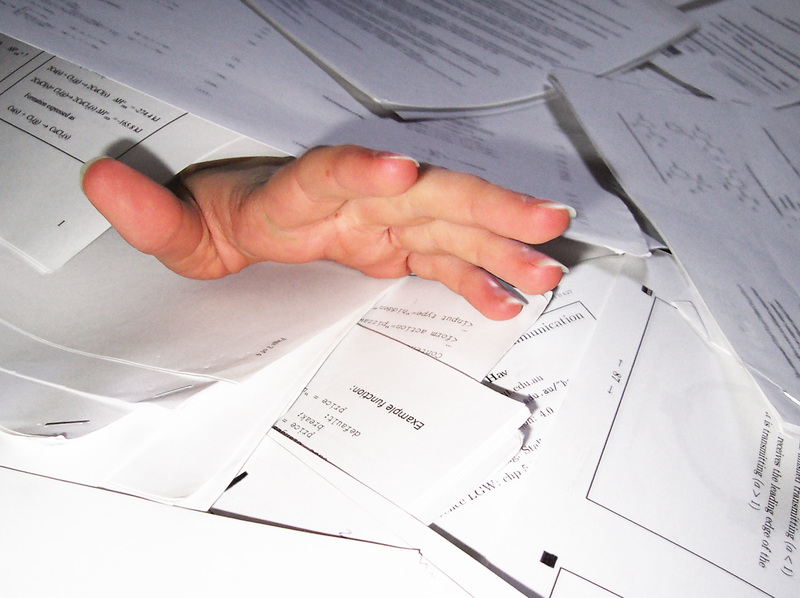 There are piles of papers that need filing, binning or shredding. There are bits and pieces that need to go back in their proper places. Somewhere there are books still to be read. There are loads of bits of paper I have acquired relating to my sabbatical studies. And there’s what I would call ‘assorted debris’. It accumulates because either I don’t have the time to deal with it, or because it’s something I would rather not deal with at the moment. Today’s the day. I am going to deal with the desk. It is long overdue. But once it’s sorted, how do I prevent it from re-acquiring the clutter? There are several answers to this. One is to put all the new clutter and paperwork in another place. That way the desk remains visibly tidy and I can work at it. But the clutter has simply been relocated. Another is to have what our pastoral studies tutor called ‘dustbin days’. Once a month he recommended to us trainee Ministers that we have a day set aside to do all the adminny stuff we have been putting off. That way the piles of papers don’t reach the ceiling and the chances of overlooking something important are diminished. It’s helpful advice and I will include it in my list of things to get around to… if I can find it on my desk. A third approach is to deal with the items as they arrive and sort them as they are completed. It’s by far the best approach. But it requires time and discipline. And, if I am honest, it may require the help of someone else. I was at my most administratively efficient when I worked as a litigation lawyer and had my own secretary. I was efficient because my secretary was efficient. I had to keep up with her. Yes, she would deal with things like filing but I had to ensure that I was able to lay my hands on papers I needed to use, so I also had to keep a tidy desk and have a system where I knew where I had put everything. When I worked in the office of the Baptist Union of Great Britain I had a three-tier filing tray. I called it my ‘hokey cokey filing system’: I labelled one tray ‘in’ (for letters and so on that were arriving on my desk). I labelled one tray ‘out’ (for letters and so on that were leaving my desk). And, yes, I had one that was labelled ‘shake it all about’ which was for letters and so on that needed to stay on my desk while I dealt with them. I had to be disciplined to keep ‘out’ and ‘shake it all about’ relatively empty because they were underneath others so they had limited capacity. I guess we apply the same sort of approaches to our lives. There are things we would rather not deal with and keep putting off, or have become ‘too busy’ to deal with. Yet they lie around, cluttering up our lives. That apology we need to offer or accept. That forgiveness we need to ask for. That persistent sin that we keep falling into. On Sundays I think many of us operate on the ‘relocation’ model. We put aside all those things and present ourselves at church looking like we have everything in order. But when we get home it’s still there. Some of us operate ‘dustbin days’. Every so often we reach a moment where we feel we have to deal with these things and make an effort to sort them out (usually starting on our knees asking God for his forgiveness and help). But the debris builds up again. The best approach is to deal with stuff as it arrives in our lives. That way it does not have time to fester (like the three-week-old sandwich underneath a pile of unopened letters)* and we can keep short accounts with God and with others, which is a healthier way of living. And by the way, ‘administration’ is listed by Paul as a spiritual gift. I think I need to pray for it. A young minister had just started in a church and felt really excited. He sat in his study and there was a knock at the door. The Minister was thrilled to have a visitor, but wanted to appear busy.